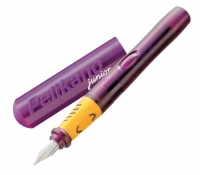 The Pelikano Junior fountain pen in an up-to-date and modern design consists of a pressure-resistant and elastic nib. Moreover, the learn-to-write fountain pen has a newly developed special gripping area for a perfect grip and a roll-away obstructor on the cap and the barrel. ~Blister packed with royal blue, small, TP/6 ink cartridge pack.